Malai kulfi, a special ice cream made in India and commonly found in all the places of India and most of the people love to enjoy this ice cream in summers. This kulfi recipe is made with very few ingredients and it just tastes awesome with only few things added into it and there is not much hard work into making this special kulfi. 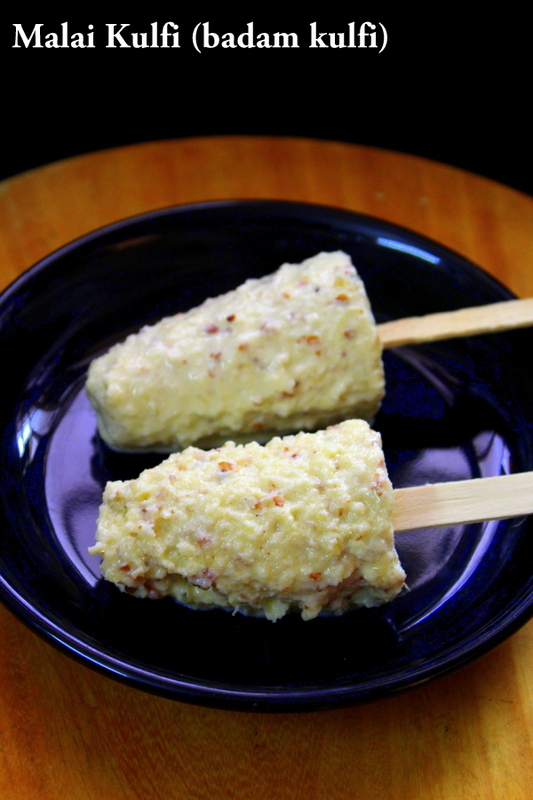 Malai kulfi, as the name suggests is very malaidar and in terms of english we can call it as a very creamy ice cream. I have made this kulfi using full cream milk and it turned out the best and I have tried making kulfi for the first time. The technique in making kulfi is to thicken the full cream milk a bit, adding crushed almonds, sugar, cardamom powder to the mixture, putting the kulfi mixture into the ice cream moulds, then freezing them for few hours and then taking the kulfi out before serving. The kulfi that has been made here in this post of mine is just creamy, malaidar and something one can easily try at home with simple stuff available at home. The procedure is very easy and one need not worry about having ice cream moulds or kulfi moulds to make them. This can be made even without moulds in our kitchens. 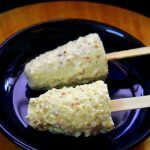 This kulfi can also be called as badam kulfi as I have added lots of crushed badam/almonds to make it crunchy and creamy. The best season to enjoy kulfi is during the summers mainly during the afternoons when the temperatures are soaring and enjoying this ice cream during the high temperatures gives much relief to the tummy and feels like having more and more. If kulfi is not available around your streets then sit back and relax as this is a very simple recipe that can be made in 20 minutes and only delay would be in setting or freezing the ice cream inside refrigerators. A lot of patience is needed as this cannot be freezed in 1 hour or 2. It requires at least 6 to 8 hours to freeze and form into an ice cream. Some of them are made in simple methods and some with many ingredients and any kulfi can be said as one of the best ice creams of India. In India a lot of desserts or beverages are made with kulfi and kulfi is one such ice cream which can be used used as a topping in many beverages or drinks such as falooda, this particular drink is served by using kulfi as the topping in most of the street corners. In summers in India, we can find various chilled stuff around the street corners and they are sold to beat the summer heat and bring some relief. We often get to spot chilled drinks such as lassi, falooda and juices such as fruit juices, shakes and mainly ice creams, ice gola with various flavors. Let us look into step by step details on how to make malai kulfi recipe and I have also shared a video showing every single step in detail in the video. Do not forget to have a look at the video and enjoy making it. 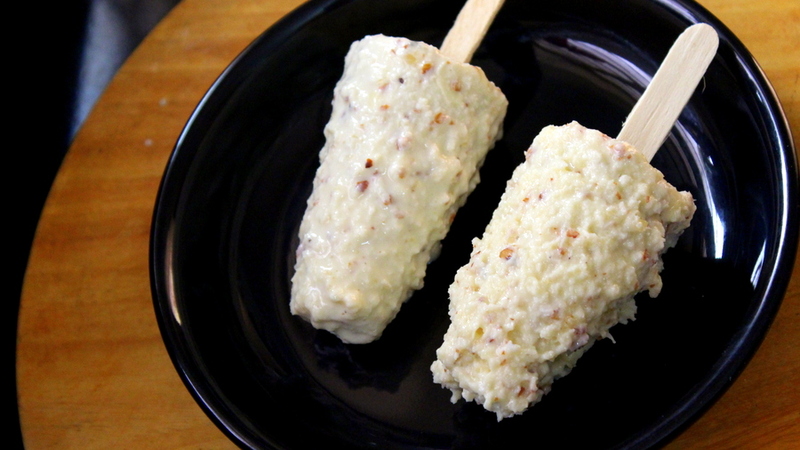 An Indian kulfi ice cream made using milk, sugar and almonds in kulfi moulds. Take a non stick sauce pan or a vessel which is non stick. Into it add the full cream milk. Bring the milk to a boil on low flame. If not stirred, the milk might burn at the bottom. Keep stirring until the consistency of the milk is reduced to 1/3 rd. The milk appears creamy after a period of 20 to 25 minutes of stirring. Add sugar as per sweetness preferred, stir well and allow the sugar to dissolve completely by stirring on low flame. Add cardamom powder, crushed almonds and mix well. Cook for a minute on low flame. Allow the kulfi mixture to cool down. Take kulfi moulds and add the kulfi mixture into the moulds. Cover the lid of the kulfi moulds tightly. Set the ice cream in freezer for 7 to 8 hours/ overnight. Take them out from the fridge. Open the lids of the moulds and roll the moulds with both the palms to loosen the ice cream. Insert ice cream sticks in between the ice cream. Carefully, delicately and slowly take the ice cream out by holding the ice cream stick and pulling the stick out along with the ice cream gradually. Have it immediately before it melts. Liked this delicious ice cream? Do give us your take on this special creamy kulfi and leave your feedback through comments in the comment section below.